The Cal Poly Meats Team brought home the Norm Eggen Championship Cup at the California Association of Meat Processors’ annual Cured Meats Competition, held Feb. 23-25 at UC Davis. The students competed in the collegiate class of 25 entries including UC Davis, Chico State and Fresno State. With its win, Cal Poly broke UC Davis’ five-year winning streak for the championship cup, named for former Cal Poly meats lecturer Norm Eggen, who taught in the 1970s and ’80s. In past competitions, the collegiate class featured a variety of sausage products. This year the class showcased flavor-coated bacons. The team developed, processed and produced the product from concept to completion. Coached by Jim Douglass, manager of Cal Poly’s J and G Lau Family Meat Processing Center, the Cal Poly Meats Team was comprised of eight students (all California residents): animal science senior Veronica Staggs of Columbia; animal science junior Connor Smith of Crescent City; graduate student Lane Koontz of Tulare; animal science junior Kira Olson of Oak Run; animal science senior Catie Field of San Luis Obispo; bioresource and agricultural engineering major Toni DeMatteo of Upland; agricultural business senior Beaujena DeSilva of San Luis Obispo; and graduate student Morgan Metheny of Atascadero. Staggs also earned the Grand Champion Award for her maple bourbon pecan bacon. Students also attended workshops, gaining industry insight into developing technologies and regulatory issues of the meat industry and networked with members of the industry and fellow university meat science students from UC Davis, Fresno State and Chico State. 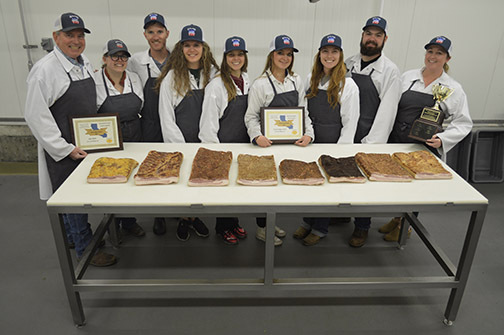 From left to right: Jim Douglass, manager of the J and G Lau Family Meat Processing Center, and students Catie Field, Lane Koontz, Beaujena DeSilva, Toni DeMatteo, Veronica Staggs, Kira Olson, Connor Smith and Morgan Metheny.